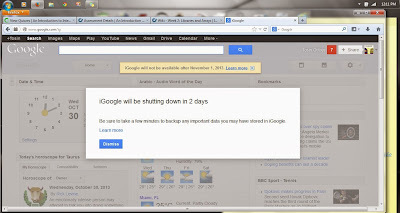 We've had 16 months notice, but I'm still going to miss my iGoogle page. We've come a long way together. 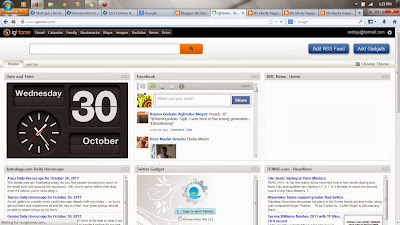 I'm using an alternative portal called igHome. Who knows, I may come to love it too. 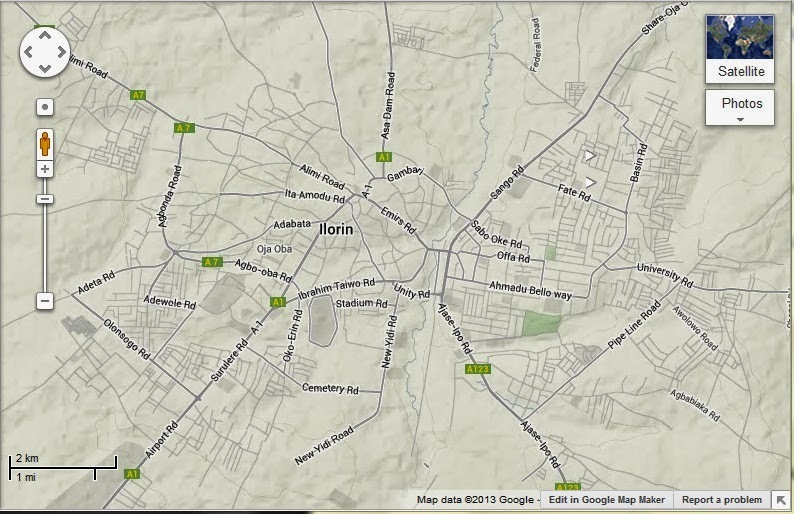 For those who have been in Kano, can you report on the underground dwelling places of the good people of Kano? Or perhaps the city is organized into highrise buildings? I ask these stupid questions because of the stupider fact that according to official records repeated everywhere from wikipedia to a website of professional urban planners (I won't be asking their services, thank you very much), Kano and Lagos states are in a dead heat for greatest population in Nigeria. An eagle flew over the country and said no freaking way. 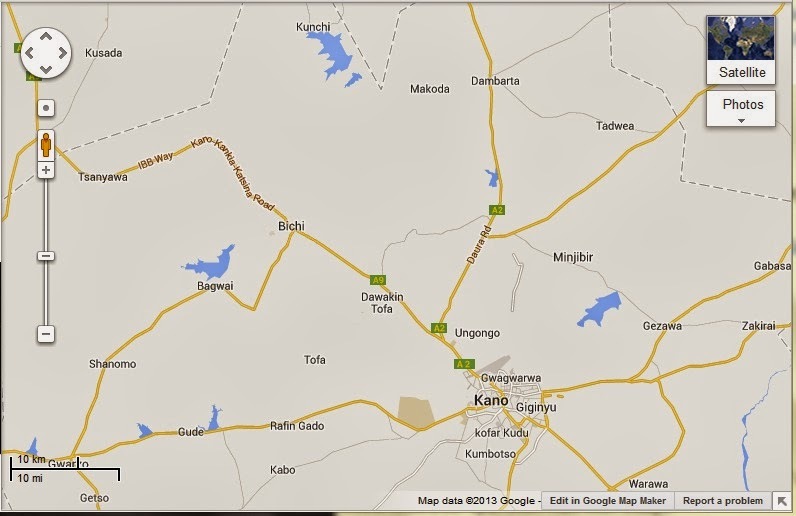 Here's a photo of the crowded city of Kano that I nabbed from Google Maps. Now let's compare with a few other Nigerian cities. Aba, with its famously dense city center, seems to be close to the same size as Kano, or at least you'll agree that pop_Aba + pop_Ilorin > pop_Kano. 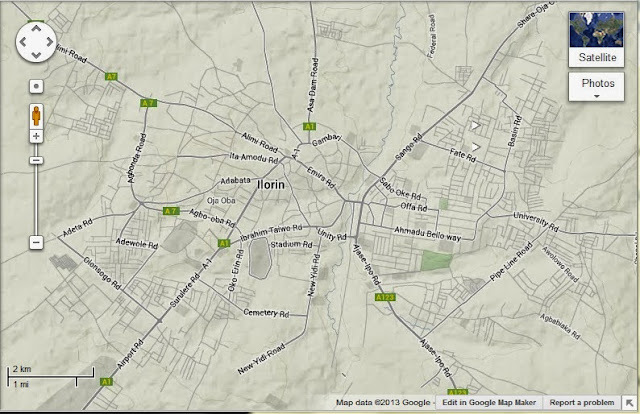 That's quiet Ilorin below. 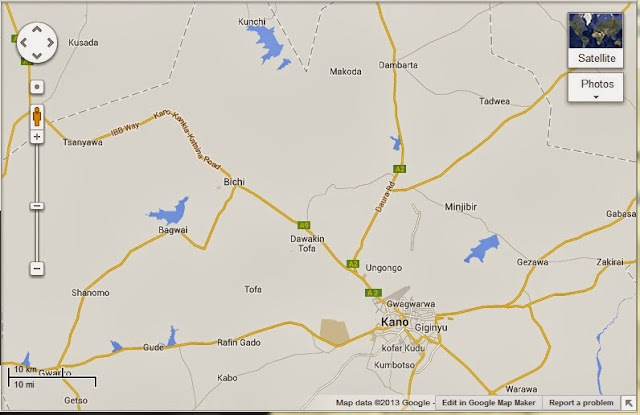 Its population may be close to half that of Kano. 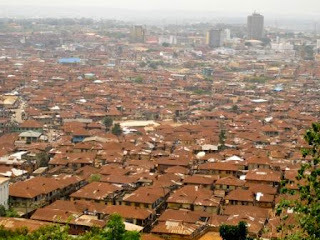 Here is Ibadan, with its famous "brown rusted roofs" - great novel of that title, get it. 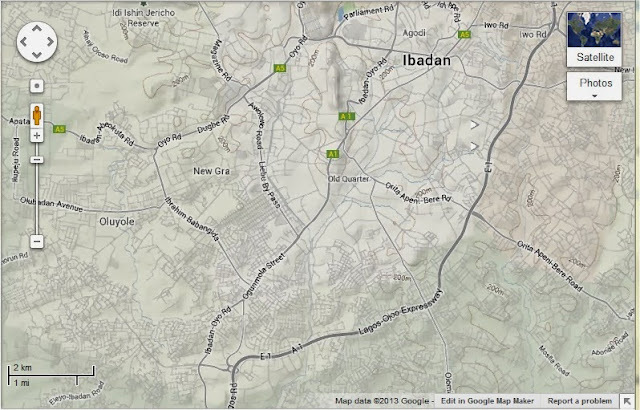 When I was a kid (the 1980s), Ibadan was said to be one of the "largest cities in Africa." Today, it is far from the largest, but in size and population it certainly dwarfs Kano. This is nothing to be proud of or ashamed of; it just is so. Above is the Northern half and below, the southern half of most of the city of Ibadan. Putting these two maps together, I'll just go ahead and guess that Ibadan has twice as many people as Kano. What do you think? Lagos is massive. Lagos is growing. 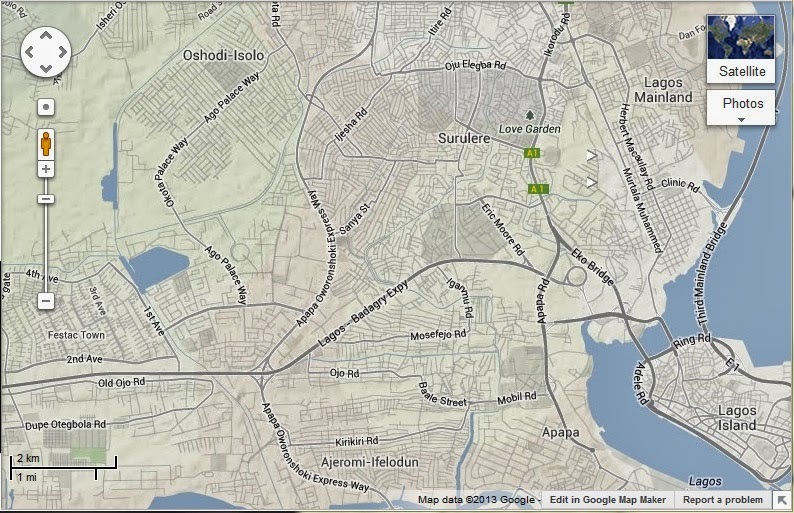 Oh Lagos has parts that you never knew were there. 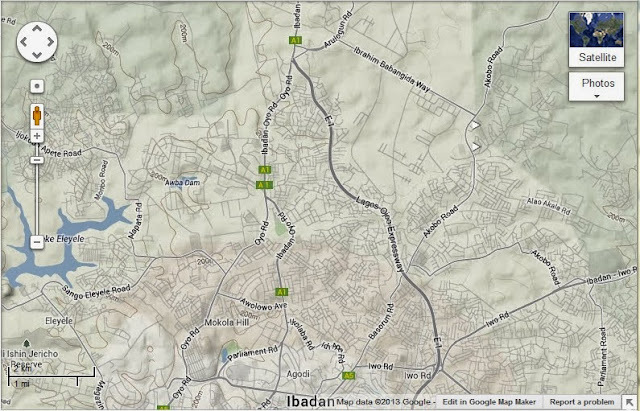 In Ikorodu, there's practically a brand new city sprouting. Lekki-Ajah - disgusting how fast the place has become crowded. Neither of those places made it into the three non-overlapping maps of some of the most densely populated parts of Lagos. Also doesn't show West of Festac all the way to Badagry. This is some of Lagos north of Ikeja. 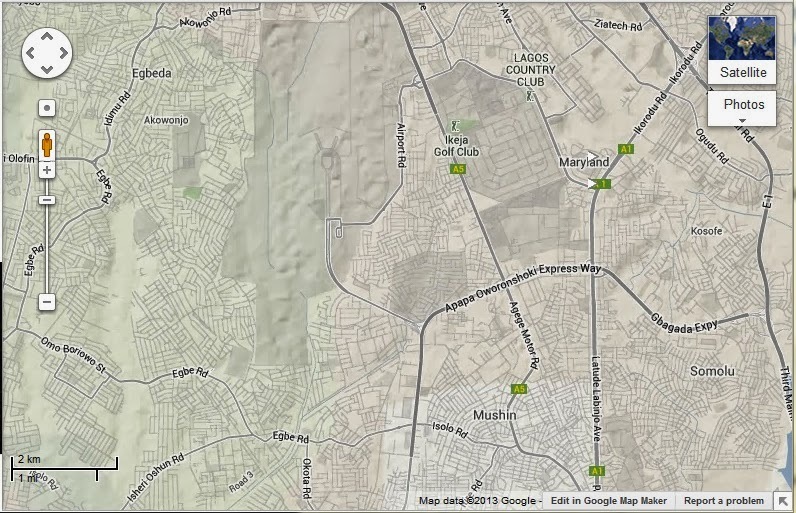 Note that all of these maps, from Kano to Lagos, are at the same scale. This is Lagos around Ikeja. Lagos around Surulere-Apapa-Yaba, south of Ikeja. 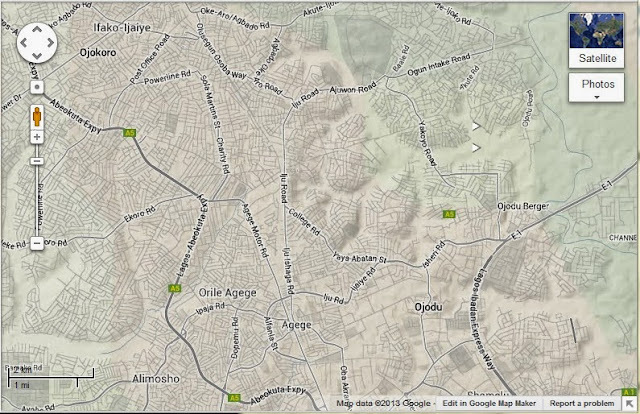 On the bottom right is a peek of Lagos Island, but not including Victoria Island, Ikoyi, and all the way to Epe. I went to school, plenty of school, that's true. But what you didn't also know is that I once won a contest to guess the number of candy pieces in a large (maybe two feet high) bottle. I won hands down. I guessed almost to the exact count of like a thousand pieces of candy. Really, just apply a little geometry and it's not that hard - area/circumference of a circle, volume of a cylinder and whatnot. My prize was the candy-filled bottle, which I moved to my dorm room, and then to my friend's room since I don't actually eat candy and might have never finished it. Hi Z.I.! Here's hoping somebody does the more detailed estimation before I have to. There are satellite images that could be used to make very good estimates of the population and settle this needlessly contentious matter of how many people we are in Nigeria and how many in each state/region/so-called geo-political zone. Until then, this data is thrash. 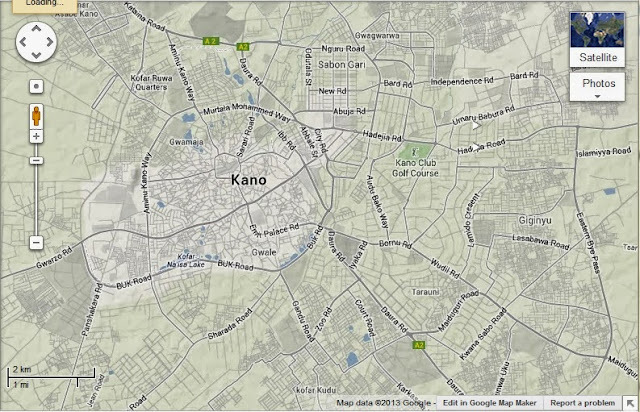 There is no universe in which Kano has a larger population than Lagos state. 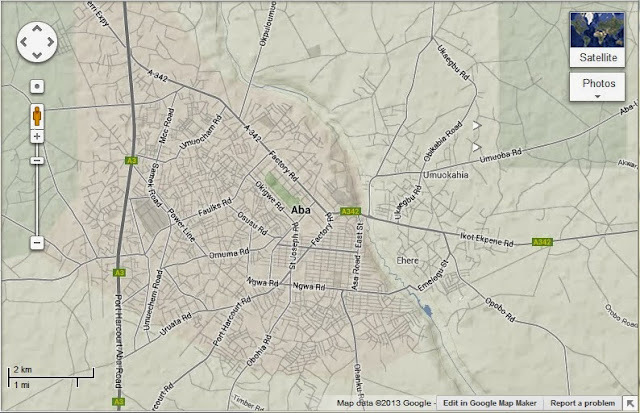 Perform your own investigations (before somebody rigs the satellite images lol) using these interactive maps of Nigeria. Religions are composed of best intentions to create law and order, knowledge and enlightenment, peace and unity. History shows us that they have also been the banner under which wars were fought, ignorance was enthroned, and corruption institutionalized from Europe to Asia and everywhere in between. The video above shows a lady named Malala Yousafzai who speaks up for the right of women to be educated in her Taliban-infested/infected country. She is only sixteen years old and is a contender for the Nobel Peace Prize since she was targeted and shot for continuing with the simple message "let us girls go to school." It is in the name of Islam that some are saying don't let women drive, keep them inside the house, they must not read. But is that what Islam, the religion of peace, is for? 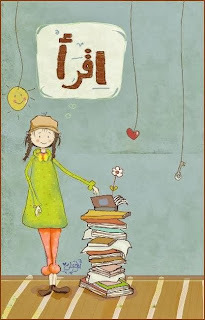 Did you know that 'Talib' as in 'Taliban' means 'student' in Arabic. This makes it all the more surprising that they are opposed to education. In parts of Nigeria, some claim to be in a group called 'Boko Haram' which translates to (Western-style) education is haram (forbidden by Islam.) But clearly, it is Boko Haram that is haram, as their activities are wicked. The Islamic leaning of the Boko Haram terrorists is questionable; you would be surprised that they wear T-shirts and western clothing and don't have the time or interest to read or memorize their Koran/Qur'an. Ordinary Nigerians have seen through them and now co-operate with the civil and military authorities to root out the terrorists. Many would say that Boko Haram leaders are Islamically-confused, especially since even Muslim leaders and Imams embrace and break bread with Christians in Nigeria. In BokoHalal, we ask the tough question, could it be that Muslims, their very name being 'people of peace' are called by God to kill unbelievers? Wafa Sultan is angry with Islam because people killed those dear to her in a frenzy of what would seem like madness, shouting Allahu Akbar all the while. This experience is something many have seen or heard of, and people ask why such should happen. Does it not mean that Islam is a violent religion? Wafa Sultan believes that Islam is not only a religion, [but also] a political ideology that preaches violence and applies its agenda by force. If that is so, then how come premier Muslim institutions such as Al Azhar have protested against such acts? If it isn't so, then how come when someone draws a cartoon of The Prophet Mohammed PBUH, or makes a video somewhere, violence is unleashed all over the world? How come we all know what a fatwa death sentence means? Who sent all these Muslims to fight for Islam? A Muslim who reads widely might find that the answer is: No One. Leave God to fight for God. Fighting for God we see now: Christian fundamentalism, Islamic fundamentalism… They give their lives because the message is a powerful one: you are martyr. I’m a Catholic so I know what I’m talking about, because my Church was founded on the blood of the martyrs. People start justifying their lives because they need raison d’etre – they need a reason to live. They are trying to convince themselves about their faith. Fighting against God: it is everywhere in the Bible. Even Jesus – fought against God. When He says, ‘God, why did you forsake me?’ on the cross, or when He asks “Take this cup away from me”. I agree that there is enough room for us to improve our own lives with religion, and to sympathize with others who are facing the same life struggle, rather than feel superior to them or use religion to torment them. When you really think about our prayer formulas in Islam and Christianity, one person says In The Name of Allah the other says Heavenly Father. Both pray lead us in the path that of righteousness, keep us from sin, same story, really not worth fighting over the difference or converting from one path to the other. In Must Religions Be In Competition, this point is made clearly with a fable involving four travellers fighting over whether to buy inab, angur, uzum, or isitafil; only to find out that all these words mean grape, only in their different languages. It is not God that is causing the clash between the civilizations, but what Nobel laureate Orhan Pamuk (of Turkey and the US) calls a "fear of counting for nothing." Pamuk says that literature has a responsibility to enlighten those who may feel self-satisfied and those who may feel humiliated and left-out in the western culture's ascendancy. But perhaps we all really need, particularly in the poorest Muslim communities, first of all, before cultural pride, is our daily bread. In fact, as B.R. Fashola, the governor of Lagos State prayed for peace at Ramadan, he emphasized how peace and prosperity go together. It seems there is some disagreement between modern thinkers and Islamic culturalists about the primacy of life and such mundane things as food and water, and maybe there ought to be some debate on this. What is a life worth? Should wretchedly poor people accept it as their destiny? Is it better to die than be humiliated? Are there really forty virgins on the other side? You can tell from the title of my blog "Life Liberty Happiness" what I think is at the core of existence and inexistence. As a woman I believe I am a human being as you are. Let the women participate in bringing us our daily bread, our laws, and our greatness. Let us use religion positively, not let it explode in our hands. As a teenager, Malala already understands this. This is why I can not call her a child, but a sage, a wise person.